Littleton, Colorado is filled with a sense of tradition. It’s everywhere you look you can see it in the timeless majesty of the Rocky Mountains. It’s in the rich trees that grow taller with every winter’s snow. These great traditions stand the test of time and make Littleton a truly a special place to live. As native Denver residents, Dennis and Dawn Martin of Coldwell Banker Residential Brokerage are proud to be part of this rich heritage, Indeed, those who know them best will tell you they are yet another great Rocky Mountain tradition. That’s because this unique father and daughter business team have been making a positive difference in the lives of local residents throughout the Denver Metro area for several generations. 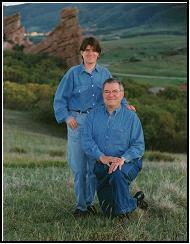 Dad, Dennis MArktin, has been selling in different real estate cycles over 30 years. from his alma mater. As business partners, they’re a winning combination that simply can’t be beat. Both are driven, self-motivated professionals who are passionate about helping the people who put their trust in them. As a team, they offer twice the attention, care and service then either could alone. The Martins like to refer to there service as “Hi-Tech and Hi-Touch” Dawn is the computer savvy entrepreneur who utilizes the very latest technology to streamline the home buying and selling process for clients. Dennis is the hands on consultant who prides himself on his extremely personal and caring service. For clients, however, it’s really the best of both worlds, which is why so many people, including their kids and grandchildren, return to the Martins for all their real estate needs. So when you’re ready to buy or sell your next home in the Denver Metro area, tap into another great Rocky Mountain Tradition. Give Dennis and Dawn Martin a call. With over 40 years of local real estate experience between them they represent A Winning Tradition for home buyers and sellers alike.